Was in Singapore over the weekend (not for the elections), so postings were put on hold. The main story back home, I guess, was the monetary policy decision on Thursday. And I did call the sudden change in Bank Negara's stance a month or two ago. Is it the right thing to do, though? I'd like to think so, mainly because the over-subsidized economy is very sensitive to price increases (i.e. % changes in Malaysia are significantly smaller than our regional neighbours) and its really easy for upward price expectations to be entrenched. 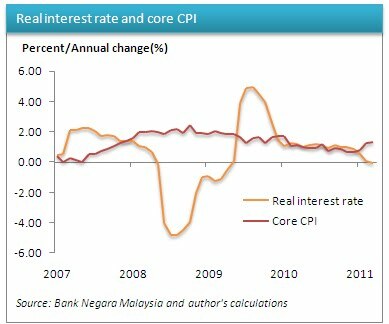 It's not practical for consumers to keep money in bank accounts which do not keep up with the pace of inflation (negative real interest rate - first reading of it in March since 2008). If anything, its going to pick up further if enough people have an inkling of this and purchase assets to hedge against inflation *cough* real estate/stock market speculators *cough*. But having said that, monetary tools can only control the demand push side of the equation. And typically, since food and fuel are so essential to everyday consumption, interest rate decisions can hardly affect the demand for those goods. So the correct measure of inflation in this regard, would be the Core CPI. And that, while accelerating, is not too far off from historical trend (yet). The counter to that particular argument is the actual acceleration of that Index, which can really, really entrench upward expectation. So if I were to judge, I think BNM may be a bit over-cautious with this, especially with many, many bad things happening overseas. But I can sympathize with inflation hawks that its a lot better to deal with future inflation if you stop it now rather than later. And no, it's not because of her reappointment before you ask.